Notice for international shoppers: Due to its light weight and compact size, we can offer attractive shipping costs of EUR 5.00 for this product to any destination outside the European Union, EUR 5.95 including VAT for any destination within the EU. Please select shipping option "Padded envelope" during checkout for economy shipping. 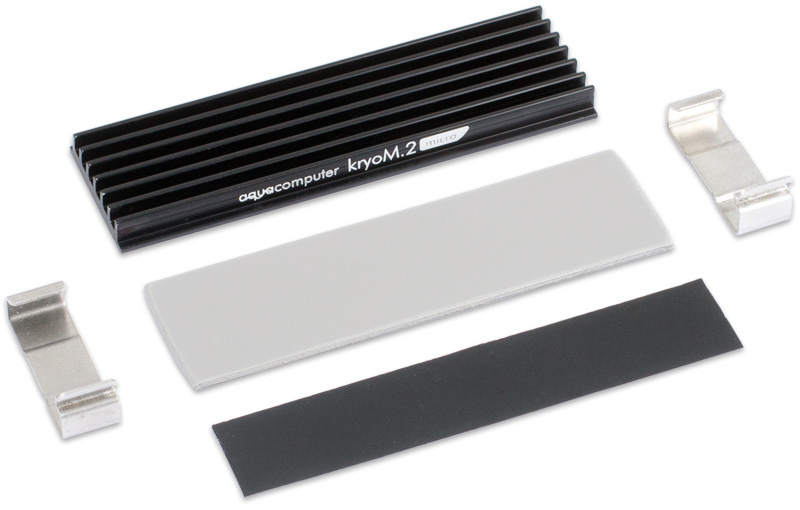 The kryoM.2 micro is a passive heat sink for single sided M.2 SSDs and is compatible with the form factor 2280. 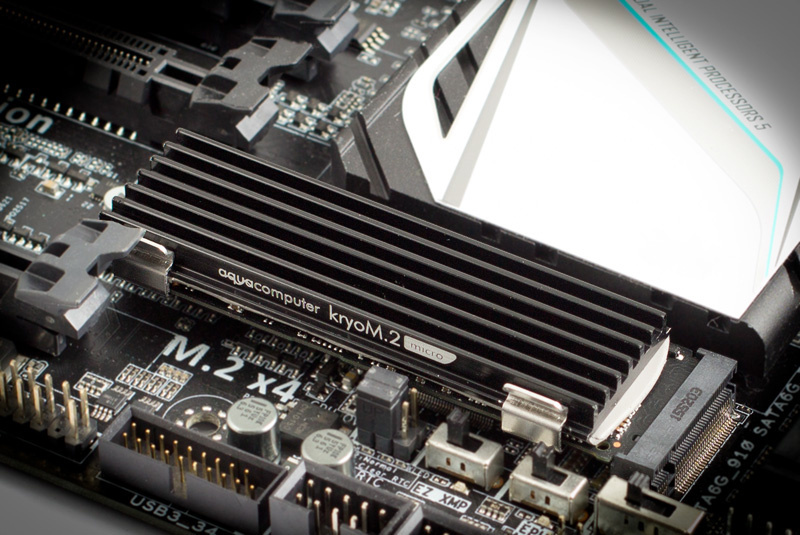 The kryoM.2 micro can easily be attached to the SSD using the stainless steel clips. The thermal pad included in delivery is installed between SSD and heat sink for optimum heat transfer. The cooling performance of the passive heat sink is sufficient for most applications. Due to the compact design, the heat sink can be used with nearly all motherboard brands and models. During installation, the SSD does not suffer mechanical stress. The clips are slid on from the sides and then clamped onto the edge of the heat sink, the clamp does not touch the edge of the SSD board. Please note: SSD not included in delivery. Compatible with M.2 form factor 2280 (width 22 mm, length 80 mm), heights S1/S2/S3 (single sided, maximum component height 1.2/1.35/1.5 mm, corresponding to max. 2.3 mm including PCB). This product was added to our catalogue on Friday, 31. March 2017.